TechGom: Nothing But Android Contest To Win LAVA Android Phone! 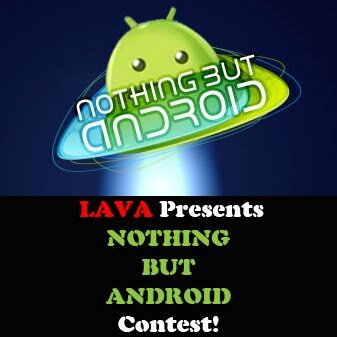 Nothing But Android Contest To Win LAVA Android Phone! In todays smartphone era, anyone looking for a new mobile device first looks for the OS it is running! Android is one of the most popular smartphone OS and is also considered the best in the market today. Lava Mobiles is giving you the opportunity to get your hands on its yet to launch Android smartphone. Lava Mobiles has come up with a cool contest called Nothing but Android. All you have to do is submit wacky entries stating why is Android your OS choice with the Nothing but Android phrase in the sentence. You can use either your Facebook or Twitter accounts to submit your entries. Make sure you post as many entries as you can! Yes, you read it correct! there is NO LIMIT on entries a participant can send. This contest will be running till the midnight of 31st October, 2011. ONLY the BEST THREE entries will be getting Lava's new Android phone even before it is launched! For more information about the contest you can visit LAVA Mobiles Nothing but Andorid Contest Page. So all you Android lovers out there grab this opportunity and send as many entries as you can! UPDATE: LAVA S12, new Android Powered Smartphone From LAVA.